Sicilian Vodka Pizza, Artichoke Basille’s, Manhattan | Parlez-Vous Loco? I know, it’s shocking … I’m back! I’m blogging again! For the 17 of you who read this, sorry for the absence. I’ll do my best to keep it going because I know you simply CANNOT LIVE ANOTHER SECOND without knowing where to get fancy-pants coffee, croissants, or overpriced olive oil. Now … let’s do this! To be a regular old workday slice, found on any number of street corners in any of the five boroughs, must be a little like being a seat filler at the Oscars. You’re beautiful by regular-people standards, but when you’re sandwiched between, say Anne Hathaway and Angelina Jolie, you could maybe be perceived as a tiny bit plain, boring even. For the past eight months, I’ve been searching for the Angelina Jolie among New York’s thousands of pizza places, and I’ve tried some really good slices–along with a few not-so-good. But when I was in my temporary Chelsea digs, I discovered the beauty that is Artichoke Basille’s Sicilian Vodka. 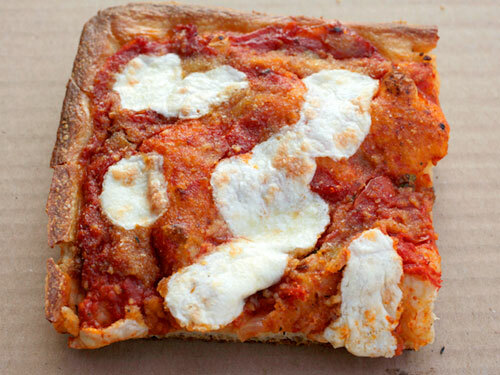 Native New Yorkers will probably scowl at this pick (or hock a loogie, as I’ve noticed New Yorkers seem to love doing), since this is a Sicilian slice and you can’t fold it. Fine. That just means more for me and my Sicilian-loving kind. All I know is that I had to actively talk myself out of detouring to get this pretty much every day that I lived in Chelsea. Luckily, there’s a not-so-gentle dietary reminder of why no one should eat a slice of this on a regular basis: the crust is deep-fried, not just once, but twice. They say on the website that it’s twice-baked, but I’m not buying baked. I’m buying fried, which is of course why it’s so good. Another little factoid for you: the blend of cheeses they use isn’t spread across the pizza in any kind of uniform fashion, which means that their tangy-delicious sauce can get a little uncontained and runny, making for a nice, messy, oozy slice. (I love that.) And one more word on the crust: if thin and light’s your thing, pass on this. This crust is thick and crunchy (deep-fried TWICE in case you forgot) and a couple of times it was too hard to even eat, but my overall experience has been good enough to keep me coming back. I prefer the Sicilian Vodka to Artichoke Basille’s signature slice, the Artichoke, which has artichoke hearts, spinach, cream sauce and three different cheeses. It just didn’t do anything for me. Maybe that’s because cream sauce doesn’t belong on pizza, but I’m willing to be proved wrong on that. For that matter, vodka in tomato sauce shouldn’t make any sense either (it really makes more sense in my chilled glass), but at Artichoke Basille, it so gloriously does.